Arsenal scored in last 3 away games in Premier League. Tottenham has over 2.5 goals in their last 7 games in Premier League. Watford scored in last 15 home games in Premier League. Tottenham has over 2.5 goals in their last 5 away games in Premier League. Tottenham won their last 3 games in Premier League. Watford won their last 4 games in Premier League. Espanyol scored in last 11 games in La Liga. Alaves didn’t score in last 3 games in La Liga. Espanyol scored in last 10 away games in La Liga. Espanyol allowed opponents to score over 1.5 goals in last 5 away games in La Liga. Hertha has over 2.5 goals in their last 4 away games in Bundesliga. RB Leipzig has over 2.5 goals in their last 7 home games in Bundesliga. Schalke 04 scored in last 3 home games in Bundesliga. Hertha scored in last 4 away games in Bundesliga. Hertha won their last 5 games in Bundesliga. Fortuna Dusseldorf scored in last 7 games in Bundesliga. Hertha scored in last 7 games in Bundesliga. Marseille has over 2.5 goals in their last 7 games in Ligue 1. Marseille has over 2.5 goals in their last 3 away games in Ligue 1. Marseille lost their last 3 away games in Ligue 1. Marseille scored in last 11 games in Ligue 1. Marseille scored in last 4 away games in Ligue 1. 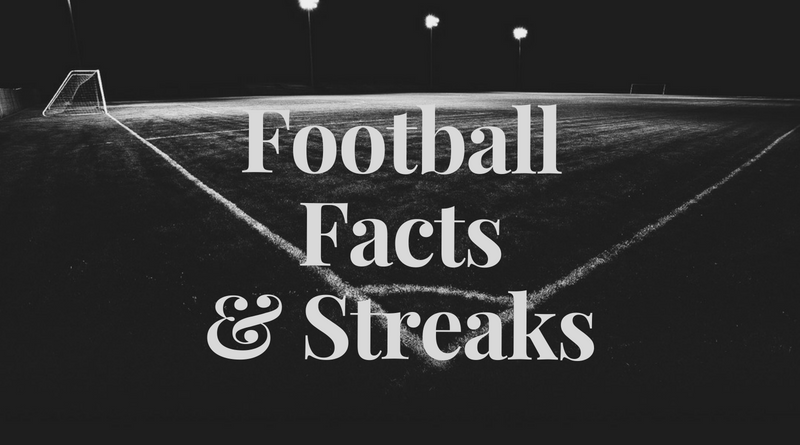 Sassuolo scored in last 3 games in Serie A.
Frosinone has over 2.5 goals in their last 3 away games in Serie A.
Chievo scored in last 6 home games in Serie A.
Napoli has over 2.5 goals in their last 4 away games in Serie A.
Sassuolo allowed opponents to score over 1.5 goals in last 3 home games in Serie A.
Frosinone didn’t score in last 3 games in Serie A.
Chievo scored in last 3 games in Serie A.
Napoli has over 2.5 goals in their last 5 games in Serie A.
Sampdoria has under 2.5 goals in their last 4 games in Serie A.
Sampdoria has under 2.5 goals in their last 3 home games in Serie A.
Napoli scored in last 3 away games in Serie A.
Santos has over 2.5 goals in their last 4 away games in Serie A (Brazil). Corinthians allowed opponents to score over 1.5 goals in last 6 home games in Serie A (Brazil). Santos scored in last 4 away games in Serie A (Brazil). Atletico Mineiro allowed opponents to score over 1.5 goals in last 6 games in Serie A (Brazil). Vasco da Gama scored in last 8 home games in Serie A (Brazil). Corinthians allowed opponents to score over 1.5 goals in last 5 games in Serie A (Brazil). Vasco da Gama allowed opponents to score over 1.5 goals in last 3 home games in Serie A (Brazil). Ipswich Town scored in last 4 home games in Championship. Norwich City allowed opponents to score over 1.5 goals in last 5 away games in Championship. Bristol City has under 2.5 goals in their last 5 home games in Championship. Blackburn Rovers won their last 3 away games in Championship. Bristol City lost their last 3 home games in Championship. Blackburn Rovers scored in last 6 games in Championship. Blackburn Rovers scored in last 3 away games in Championship. Inter Turku allowed opponents to score over 1.5 goals in last 8 games in Veikkausliiga. Ilves has over 2.5 goals in their last 3 away games in Veikkausliiga. Mariehamn allowed opponents to score over 1.5 goals in last 5 games in Veikkausliiga. Inter Turku has under 2.5 goals in their last 5 games in Veikkausliiga. Inter Turku didn’t score in last 3 games in Veikkausliiga. Ilves scored in last 6 games in Veikkausliiga. Inter Turku allowed opponents to score over 1.5 goals in last 8 away games in Veikkausliiga. Ilves scored in last 3 away games in Veikkausliiga. AZ Alkmaar allowed opponents to score over 1.5 goals in last 3 games in Eredivisie. Groningen has under 2.5 goals in their last 4 home games in Eredivisie. Zwolle lost their last 3 games in Eredivisie. Groningen didn’t score in last 4 home games in Eredivisie. Groningen allowed opponents to score over 1.5 goals in last 5 home games in Eredivisie. Vitesse has under 2.5 goals in their last 3 games in Eredivisie. Vitesse allowed opponents to score over 1.5 goals in last 3 home games in Eredivisie. Vitesse allowed opponents to score over 1.5 goals in last 5 games in Eredivisie. Ajax allowed opponents to score over 1.5 goals in last 6 games in Eredivisie. Sarpsborg 08 has over 2.5 goals in their last 3 games in Eliteserien. Sarpsborg 08 scored in last 3 games in Eliteserien. Bodo/Glimt scored in last 4 home games in Eliteserien. Bodo/Glimt scored in last 6 games in Eliteserien. Bodo/Glimt allowed opponents to score over 1.5 goals in last 3 games in Eliteserien. Molde has over 2.5 goals in their last 6 games in Eliteserien. Molde scored in last 6 games in Eliteserien. Odds scored in last 5 games in Eliteserien. Rangers ended draw their last 3 games in Premiership. Rangers ended draw their last 3 away games in Premiership. Celtic scored in last 8 home games in Premiership. Rangers scored in last 5 games in Premiership. Rangers scored in last 4 away games in Premiership. Orlando City has over 2.5 goals in their last 4 games in MLS. Orlando City has over 2.5 goals in their last 3 home games in MLS. Philadelphia Union has under 2.5 goals in their last 3 games in MLS. Philadelphia Union won their last 6 games in MLS. Philadelphia Union won their last 3 away games in MLS. Portland Timbers has over 2.5 goals in their last 3 away games in MLS. Portland Timbers lost their last 3 away games in MLS. New England Revolution lost their last 6 games in MLS. New York Red Bulls has under 2.5 goals in their last 3 games in MLS. New York Red Bulls scored in last 5 away games in MLS. New York Red Bulls scored in last 10 games in MLS. New York Red Bulls allowed opponents to score over 1.5 goals in last 3 games in MLS.